Newcastle United vs Leicester City: What time is kick-off, is it on TV and what are the odds? Newcastle United go in search of their first Premier League win of the season against Leicester City on September 29. Rafa Benitez' men welcome the 2016 champions to St James's Park in desperate need of kick starting their season following a tough start. Kick off at St James's Park is at 3pm on Saturday, 30 September. Neither Sky Sports or BT Sports are showing the game on live TV, however it will be available for those watching in selected countries abroad. How can I follow the Newcastle v Leicester live? You’ll be able to follow all the latest updates and team news via the Newcastle United section on the Shields Gazette website. Simon Hooper is the man in the middle. He awarded the Magpies a penalty when he last visited St James's Park in a 1-1 draw with Burnley. Mike Dean is the fourth offiical. Salomon Rondon could miss the game after he was subbed at half-time following the 0-0 draw with Crystal Palace last time out. If so, Joselu is likely to start the game as a lone striker. Jonjo Shelvey returned to the starting 11 last time out after missing the previous three games through injury. Leicester summer signing James Maddison has began to find the net recently while Jamie Vardy always looks a threat. Rachid Ghezzal is still finding his feet following the winger's transfer from Monaco. The Foxes feel like they have a new signing in Papy Mendy - his Leicester looked over when he was loan out last year. What is the form of the Newcastle and Leicester? The Magpies remain in the bottom three though moved up a place after their draw with Crystal Palace on Saturday. 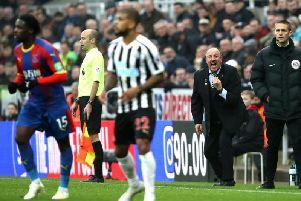 Benitez's side had a difficult start playing Tottenham Hotspur, Chelsea, Manchester City and Arsenal so Leicester is viewed as a good start to kick start their season. Leicester occupy ninth spot with three wins and three defeats. Their only away win so far followed at Southampton in a 2-1 victory.